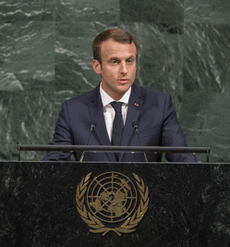 UNITED NATIONS, Sep 20 2017 (IPS) - French President Emmanuel Macron delivered a sombre speech at the United Nations General Assembly yesterday, denouncing Myanmar’s “ethnic cleansing,” and calling for better protection of refugees in the world. His decisive speech at the lectern took a sharp turn from the U.S. President Donald Trump’s speech earlier that morning, who focused on a nationalist agenda, urging leaders to put their countries first as he invoked his “America First” vision. Macron led his speech with a multilateral approach, and vowed instead, to fight climate change with all member countries. In a press conference later, he added that he would try to persuade Trump to reconsider his decision to pull out of the Paris agreement. Macron, a centrist who ran his recent presidential campaign on open borders, kept in line with his advocacy for protecting refugees as a “moral duty.” He addressed human trafficking along the Mediterranean route, and said that greater checks and a “humanitarian infrastructure” should be put in place to stem blatant flouting of “fundamental human rights” by traffickers. While Trump touted topics that invoked a mainstream media frenzy—but are nevertheless important national security issues—such as threatening to “totally destroy” North Korea, and reiterating his critical views of the 2015 Iran deal by slamming it as an “embarrassment,” Macron led the speech in a more conventional way, as is convention, in essentially the headquarters of world diplomacy. Macron said that he was willing to open dialogues with the North Korea’s leader, and added that migration and terrorism, which are political challenges, couldn’t simply be addressed by “short-term” strategies. Similarly, he committed to contribute to developmental aid, and said that the process, for him, began with investing in education. “We must give the opportunity to young boys and girl to obtain an education to choose their own future, not the future that is imposed on them by need but the future that they should choose for themselves,” he said. In the end, in spite of criticising the world body as a “club for people to get together, talk and have a good time” before, Trump praised the UN body for its immense potential to bring deliberations at the world stage.